ST. Joseph's Hospice is on the lookout for daredevil Everton fans to join them in a zip wire challenge they will never forget. The Hospice has places up for grabs for anyone who fancies zipping across the famous pitch at Goodison Park and, this year, the route is longer and better than ever. The zip line will go diagonally across the pitch from the top balcony corner of the Main Stand, close to St Luke's Church, right the way across to a specially constructed platform in the Bullen's Road corner of the Sir Philip Carter Park Stand. This new route will make the experience longer and faster than ever before and, for blues fans, will be 1 of the most unforgettable ways to raise money for patients at St Joseph's Hospice in Liverpool. 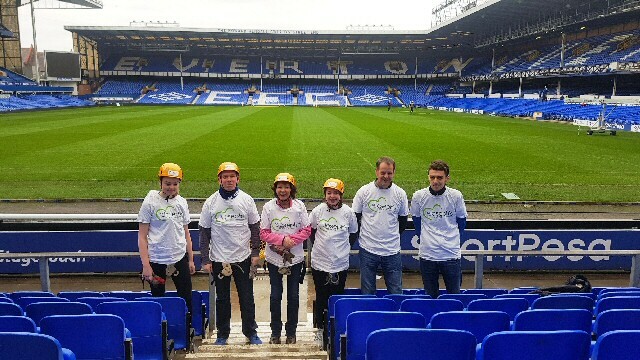 The Goodison Park Zip Wire Challenge will take place, on Saturday, 30 March 2019. Places are available now on a 1st come, 1st served basis. To sign up, there is a registration fee of ₤30 and a minimum fundraising target of ₤100. Age and weight limits apply. To find out more visit:- Jospice.Org.UK or to secure your place, call the Hospice's fundraising team on:- 0151 932 6044 or send them an email. Julie McAdam, fundraiser at the Hospice, said:- "This will be the third time we have taken part in the Goodison Park Zip Wire Challenge and this year will be better than ever because the route is longer and more exciting. It will be a fantastic experience for any Everton fan and the best things is that by taking part you will be raising money that will be put to very good use, helping to fund end of life and palliative care for patients at the Hospice." Deputy Mayor and Cabinet member for Culture, Leisure and Sport, Cllr Wendy Simon, said:- "We want every resident and professional in Liverpool that has a responsibility for the health and future life chances of children and young people to play their part. This is about working together to commit to actions to provide every opportunity for children and young people to be active every day. There is great work going on in our Schools, community organisations and sports clubs every single day to get young people active; the trick is to spread that work as far and as wide as possible and make it part of the DNA of the City." The development of the Liverpool Active Promise has been driven by Liverpool City Council in partnership with Liverpool Clinical Commissioning Group (CCG), young people, Schools and key stakeholders. Partners include the Youth Sport Trust (YST) - a national charity which promotes the life-changing benefits that come from play and sport. YST were commissioned to work with young people and key stakeholders to create the Active Promise and will be present at the launch. Youth Sport Trust Chief Executive Ali Oliver said:- "We have been delighted to support the development of this important plan which will ensure more young people in Liverpool enjoy the life changing benefits of play and sport. At a time of increasingly sedentary lifestyles, too many young people are missing out on the power of physical activity to tackle the biggest challenges facing this generation. We know a focused Physical Education curriculum, daily physical activity and accessible and purposeful School sport can promote healthy weight and mental health; it can reduce stress and anxiety and help develop vital life skills and character traits like teamwork, leadership, resilience and empathy. The publication of this plan makes an important statement about the place of sport and play in giving children a better future. It is fantastic that Liverpool are helping to lead the way in this area and we would encourage others to follow Liverpool's lead." Karen Smyth, Chair of Liverpool Secondary Headteachers Association, added:- "It is crucial that we all act now as a collaboration of stakeholders in understanding and engaging children and young people in positive activities that have a particular impact on their emotional wellbeing. This is a priority for us as now more than ever as the changing patterns of play, travel and leisure are leading to inactivity and unhealthy lifestyles for many of the students that we see every day in our Schools. As Schools we recognise we have the key role we play alongside community organisations, physical activity providers and parents/carers, in ensuring children and young people have appropriate opportunities to be active every day." Dr Maurice Smith, a Liverpool GP and Clinical Director at Liverpool Clinical Commissioning Group (CCG) said:- "The Liverpool Active Promise is all about helping children and young people in our City to get the very best start in life, by working together to maximise opportunities for them to participate in physical activity and sport. Being physically active is vital for a child's healthy growth and development, and it also lays the foundations for better health right into adulthood too. From improving confidence, self esteem and mental well being, to helping to prevent conditions such as heart disease, type 2 diabetes, stroke, and certain cancers, the benefits of being physically active are profound; which is why we're encouraging everyone to get involved." 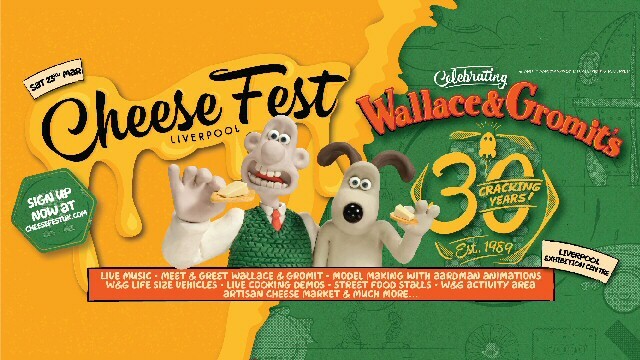 THE Liverpool Exhibition Centre are very excited to announce that CheeseFest UK is heading to them, and will be landing at the Centre, on Saturday, 23 March 2019, celebrating 30 cracking years of Wallace & Gromit. Expect the most incredible melted delights and delicious cheese based cuisine presented for your culinary pleasure by the finest fromagers from across the land. Experience some of the greatest cheeses in the world with:- melted raclette, gooey mozzarella sticks, top notch toasties, and a whole host of unique slices and cheese innovations from the UK's best traders. 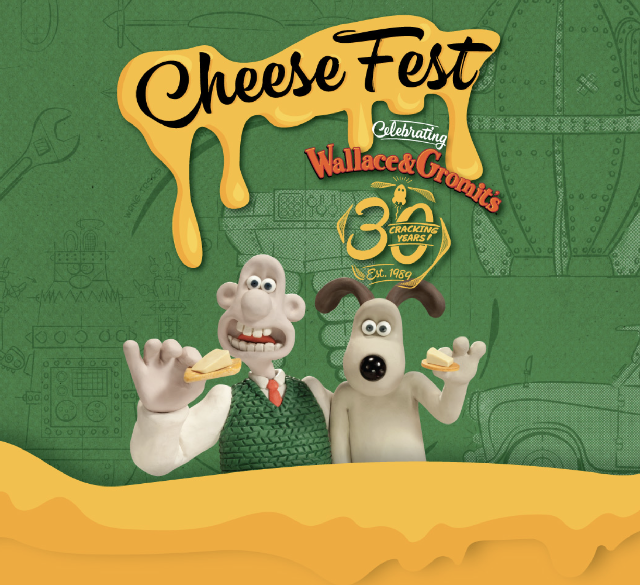 CheeseFest promises to be a grand day out for all the family with a jam packed programme of feasting and entertainment hosted by the world's most famous Cheese Ambassadors Wallace & Gromit. Kids can enjoy model making, life size vehicles, film screenings of popular Wallace & Gromit movies, and a meet and greet with Wallace and Gromit themselves. Young and old, all are welcome, so don't be sheepish; get involved! To register for tickets please go to:- ExhibitionCentreLiverpool.Com.